The demise of HMV has been seen as a death knell for music megastores. But look west and a glimmer of hope is on the horizon. At Amoeba Records in Los Angeles, the world’s largest independent record shop, the aisles are humming with the click-clack of CDs and the rustle of old vinyl sleeves. If Thin Lizzy wasn’t playing so loudly, you’d be able to hear the cash tills chiming by the second. Stepping into this cavernous vault, under a giant “Give Peace a Chance” banner, is a nostalgic trip back in time to what record stores used to be like – only it’s much bigger. This is where the masses still come to worship their idols, a church for all the musical faiths from punk to funk, ska to Gregorian chant. Angst-ridden teenagers skulk in the corner of the heavy-metal section, greying former hipsters fondly caress obscure discs they thought lost, a pink-haired girl reads a book about Led Zeppelin, and a couple kiss next to the stand of NME magazines. Absent are HMV’s migraine-inducing pink signs, its plasma screens and internet hubs, and the children screaming for the latest Wii game. Where HMV was a sterile, soulless factory churning out merchandise, this is a place of sanctuary for genuine music lovers, its walls comfortingly lined with vintage record covers and concert posters. Amoeba, which has another store in San Francisco, stocks one million items and proves that large bricks-and-mortar music stores can prosper in the digital age. Had HMV paid attention, it might have learnt how. 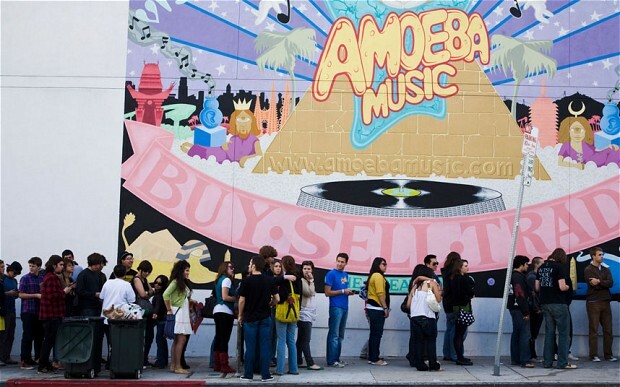 Amoeba’s three key principles are customer service, variety of stock, and what regulars refer to as a “cool vibe”. The aim is to maintain the spirit and charm of an independent shop, but on the scale of a megastore. On arrival, the first thing you notice is that the assistants appear to have encyclopedic knowledge of everything from Britney Spears to Haitian Rara music. Extensive racks feature the usual Justin Bieber and Gangnam Style CDs, and the Blu-ray Harry Potter box set. But should you be seeking, say, REO Speedwagon on vinyl, an old 45rpm Sonic Youth record, Lawrence of Arabia on a laser disc or Top Gun on VHS, you can find that, too. If your interests extend to Japanese Shakuhachi flute music, punk bands such as Cobra Skulls and Hatebreed, there’s also plenty of that. Perhaps the most obscure item stocked by the store is referred to by staff as the the “Marcel Marceau record”. It was completely silent, and someone bought it. 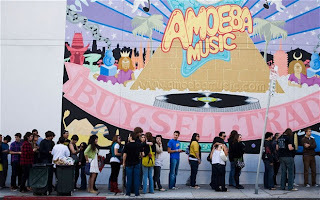 Amoeba also hosts free live concerts, another tactic HMV could have picked up on. On Thursday night, 800 people packed it to capacity for indie rock band Yo La Tengo, and many bought CDs recommended by staff on the way out. “Awesome,” said a smartly dressed woman as an assistant suggested something called “Country Funk”. Apparently, it’s flying off shelves as word of mouth spreads. Of the 240 people who work in the LA store, almost all are musicians, actors, DJs or artists (some work only occasionally and many are part-time). If you don’t like one of their recommendations, you can bring it back for a full refund. It is not unknown for delighted customers to give staff a hug, which might have raised an eyebrow at HMV. The clientele themselves are a mixture of people who look like they came straight from Woodstock, some wearing dark sunglasses indoors, and others who appear to have popped in after work at an office. Many of them are young and carrying iPhones, but they have rebelled against internet download services such as iTunes and Spotify. “I like physical music, there’s a value in being able to hold it rather than just listen to it on headphones in your room,” says Jake Munk, 19, as he buys a Kurt Vile CD and Mikal Cronin vinyl album. Moses Macedo, a 22-year-old student, has made a two-hour round trip to explore the “gothic and industrial” section for artists such as Suicide Commando, Raised in Black and Velvet Acid Christ. “This electro-industrial stuff’s not even on iTunes and the vibe here is something I really love,” he says. Amoeba has embraced the internet with a YouTube channel, Twitter and Facebook accounts to promote itself. Customers can buy and download music off the website, but most prefer to visit the store, where CDs still make up around 50 per cent of its sales. Vinyl doubled to 20 per cent last year. And profits for the first half of January were up five per cent year on year. There is no heavy discounting, or three-for-two deals, but lots of bargains if you hunt around and plenty for the nostalgic, including VHS and audio cassettes.